Governments at all levels have seen dramatic increases in availability and use of data over the past decade. 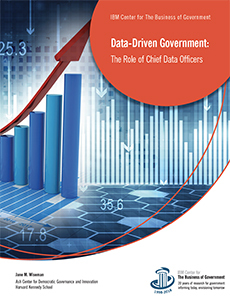 The push for data-driven government is currently of intense interest at the federal level as it develops an integrated federal data strategy as part of its goal to “leverage data as a strategic asset.” There is also pending legislation to require agencies to designate chief data officers (CDOs). Ms. Wiseman’s report provides rich profiles of five pioneering CDOs in the federal government and how they have defined their new roles. Based on her research and interviews, she offers insights into how the role of agency CDOs is evolving in different agencies and the reasons agency leaders are establishing these roles. She also offers advice on how new CDOs can be successful at the federal level, based on the experiences of the pioneers as well as the experiences of state and local CDOs. View our infographic on the report! Read the article on the report published in the National Law Review. Read the article on the report published by Federal News Network.